Since its founding in 2016, Purple has taken the bed-in-a-box world by storm, becoming one of the most recognizable brands on the scene. 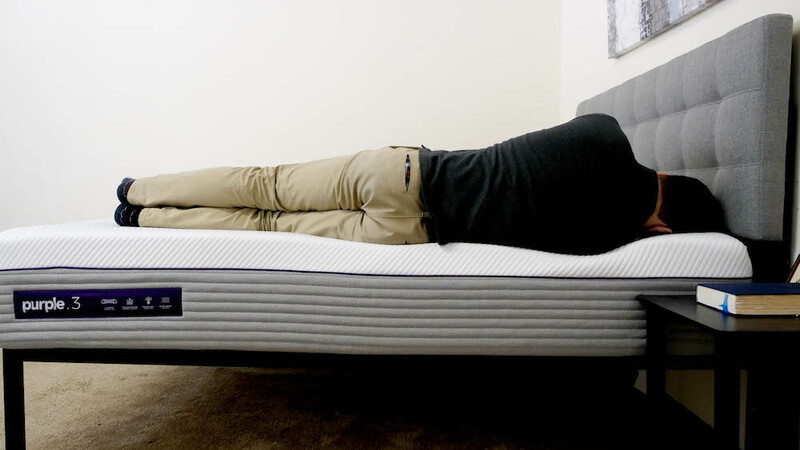 While the product line has expanded to include everything from pillows to sheets to seat cushions, the company had yet to release a second mattress… until now. Enter the New Purple Mattress, a hybrid bed that comes in three different firmness levels: P4 (soft), P3 (medium) and P2 (firm). Today I’ll be focusing mainly on the P3, but I’ll also be taking a quick look at the P2 and P4, all in an effort to figure out if one of these beds could be the perfect one for you! Continue reading below for my full review of the New Purple mattress. Don’t have time to read it all? Click here to skip to the bottom and check out my review summary. The New Purple features a hybrid design, which combines pocketed coils with the brand’s proprietary hyperelastic polymer for a sleeping experience that aims to be as pressure-relieving as it is supportive. I should note that this construction is different from that of the original Purple, which doesn’t use any coil system. I’m excited to see how all these different materials work with one another, so let’s dive on in to the New Purple! Cover – The cover is built with a polyester and spandex blend, making for a material that’s thick, stretchy and breathable. Comfort Layer – The comfort layer is made up of the brand’s Smart Comfort Grid™, which is composed of a hyperelastic material that adapts to your body in real time. 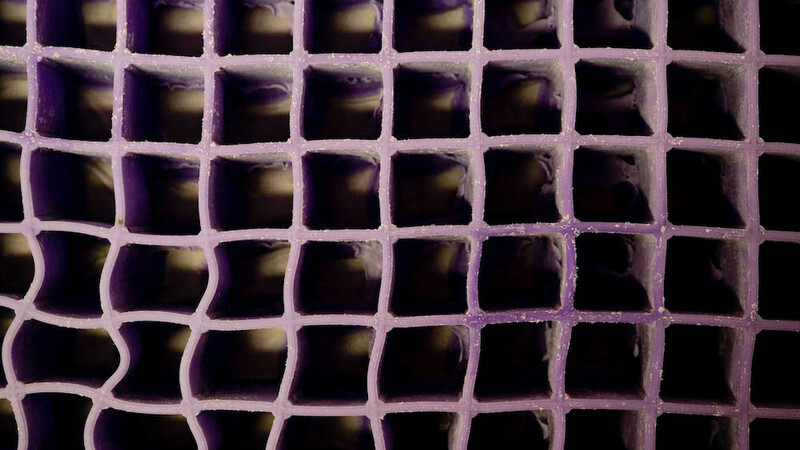 While all three versions of the New Purple feature this grid, the thickness varies depending on the number attached to the name. So, the P3 has three inches of the stuff while the P2 boasts two and the P4—you guessed it!—has four. Regardless of how much each mattress has, the temperature neutral material provides immediate pressure relief and pleasant body contouring. I should note that the grid is surrounded by a layer of foam edge support, which gives this section some structure and allows you to use the entire surface area of the mattress. Transition Layer – A thin layer of polyurethane foam separates the soft comfort layer from the pocketed coil system below. The main function of this section is to transition the sleeper between the different materials. Support Layer – The support layer is comprised of 7.5” of responsive coils. These bad boys are individually wrapped, so they’re not only going to provide support to the sleeper, but they’re also going to be excellent at isolating motion. Additionally, the pocketed coil system works to extend the pressure relief of the top comfort layer throughout the entire structure. The combination of this support system with the polymer grid makes for an extremely bouncy mattress, which will prevent you from feeling stuck. A 4” layer of high-density poly foam edge support (6” if you decide to go with a King) surrounding this section will also help lift you up and out of the structure. Foundation Layer – The base is made up of a thin layer of high-density poly foam, functioning mainly as a springboard for the pocketed coil system above. As I mentioned up top, one of the biggest changes in the New Purple is its hybrid design. The inclusion of pocketed coils here creates an overall bouncier structure than its predecessor, which helps to lift the sleeper up and out of the bed. The addition of edge support also helps to create more stability as it prevents deep compression at the sides of the bed. 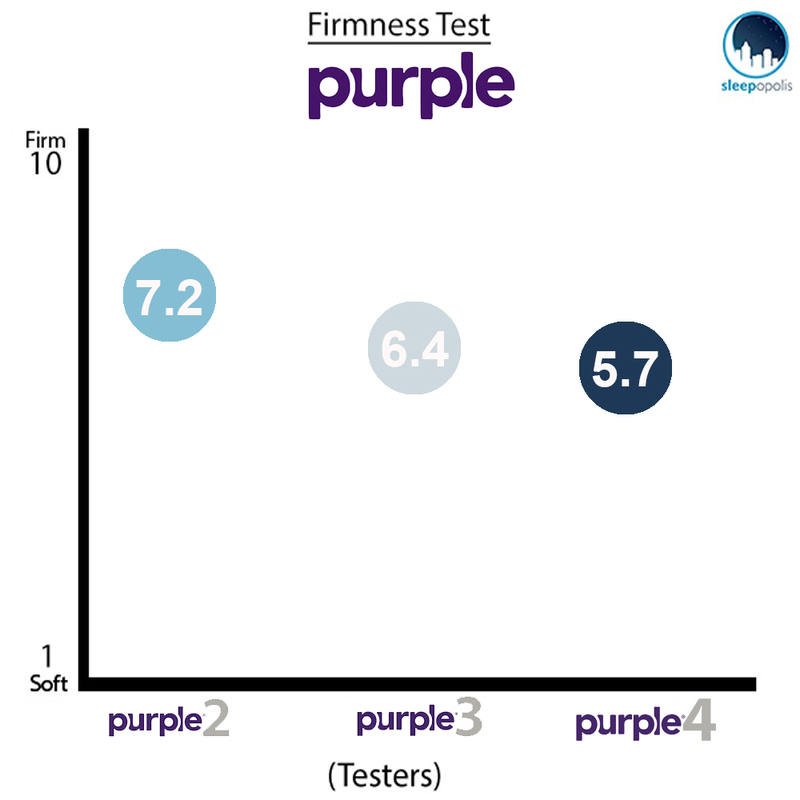 After taking a look at the construction of the New Purple, let’s chat about the firmness and feel. I started off by applying light hand pressure and found that I was interacting with the hyperelastic polymer in the comfort layer. A common question with Purple is whether or not this grid section is going to feel strange on the body, but I found that the walls pretty much collapsed immediately, creating a flat, pressure-relieving surface. Pressing in further, I began to experience the bed’s tremendous bounce, which lifted me up and out of the mattress. 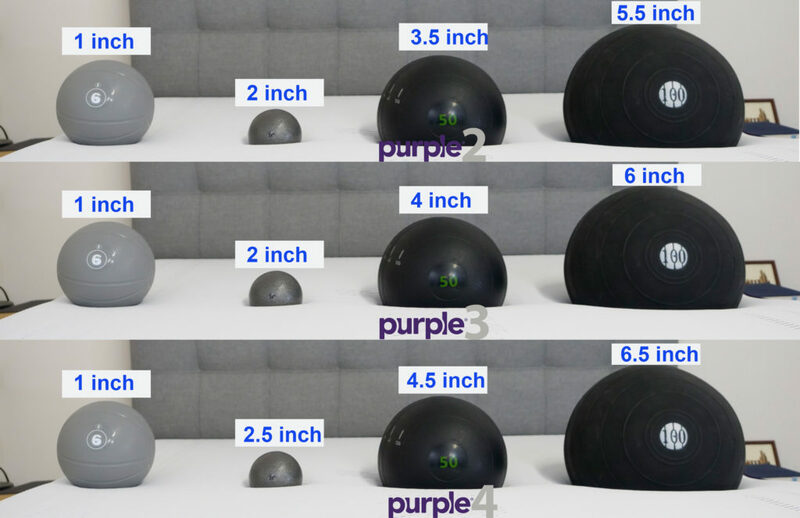 Since people of different body types are going to feel firmness differently, I decided to continue investigating the feel of the New Purple with the help of three other testers. Each person gave the mattress a quick spin and reported back their personal firmness rating to me, which I then compiled on the below graph alongside my own. While feel will always be subjective, our responses will hopefully give you a better sense of the firmness range you can expect from the bed. 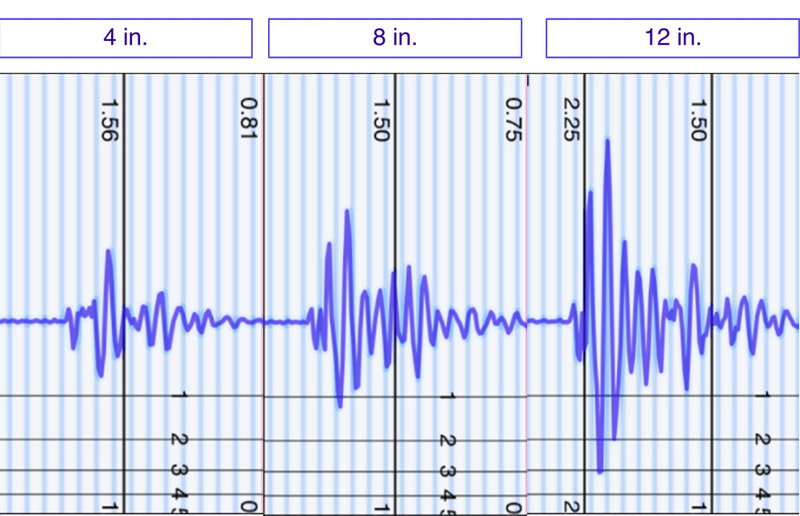 As you can see in the graph above, my testers gave the P3 an average rating of 6.4. When compared to the industry standard of 6.5 for medium firmness, it’s clear that this bed is medium firm. I personally gave the P3 a 6.5, finding it to have a nice mix of pressure relief and support. While you’ll definitely sink through the comfort grid, the buoyant lift of the pocketed coil system will prevent you from feeling stuck in the mattress. This should satisfy a wide range of sleepers, particularly those who sleep in multiple positions throughout the night. I should note that a person’s weight can make a big impact on how they’ll experience a Purple mattress, with heavier sleepers sinking through the comfort grid much more quickly than lighter ones. 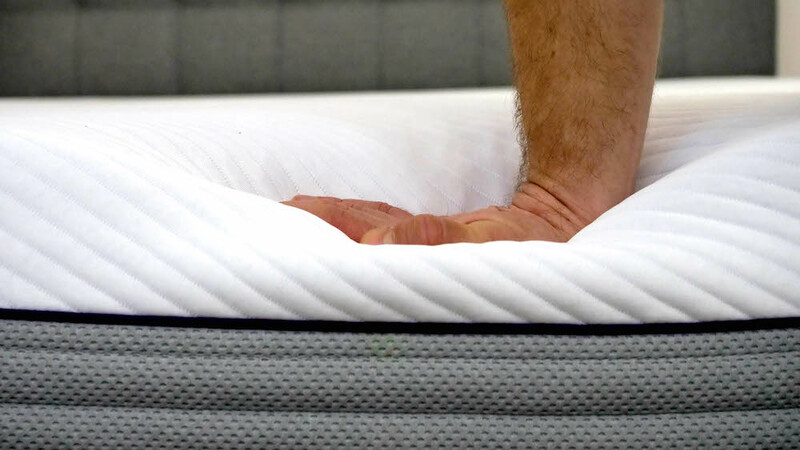 This is part of the reason why the brand decided to create multiple firmness levels for its new mattress, to alleviate some of this discrepancy. So, if you’re in the market for a softer feel, I’d recommend checking out the P4, which received an average firmness rating of 5.7 from my testers. For a firmer feel, you may want to consider the P2, which my testers gave a 7.2. Rather than merely describing the feel of the P3 to you, I wanted to give you a visual representation of where you might feel pressure form while lying on it. To do this, I placed a pressure map on top of the mattress and lied on my back, side and stomach. You can see the results on the image below where pressure is represented from blue (low pressure) to red (high pressure). Back – Lying on my back, I felt as though my weight was evenly distributed across the surface of the bed. In this position, I noticed a good balance of support and pressure relief, with the comfort grid pleasantly filling in the space at my lumbar region. Given the quality bounce of the mattress, I found it easy to change positions and felt like I was definitely sleeping on top of the bed as opposed to in it. Side – As you can see in the graphic above, I experienced a lot of pressure relief in this position. Side sleepers tend to feel tension at their shoulders and hips as they sink deeper into a mattress, so the results of this test suggest that that this bed would be good for those who doze on their sides. That being said, strict side sleepers may prefer the P4 even more than the P3 because of its thicker comfort layer. Stomach – On my stomach, I continued to feel a good mix of pressure relief and support from the New Purple. My hips didn’t sink too far into the mattress and I felt as though my spine was in a nice alignment. However, since stomach sleepers tend to prefer firmer mattresses, I’d suggest checking out the P2 if you sleep exclusively on your stomach. For my next test, I’m going to explore the New Purple’s motion transfer. 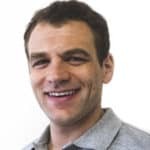 These results will be important for anyone planning to share their bed with a partner as it’ll reveal how much motion is detectable from one side of the mattress to the other. In layman’s terms, this’ll let you know how annoyed you’ll be when your bed mate gets up for a midnight snack in the middle of the night. Considering just how bouncy this mattress is, I’d say that the results are pretty good. You’ll note an increase in disturbance with each higher drop, but this is to be expected. What’s more surprising is how much movement the P3 is able to contain given how quickly all of its materials respond to pressure. I’d attribute most of this to the individually wrapped coils, which are great at isolating motion. So while you’re likely to feel your partner moving around at night, the amount of movement shouldn’t be that extreme. Next up, I’m going to put the New Purple through a sinkage test. The results will tell me whether or not you’re going to feel like you’re sinking “into” the mattress or sleeping “on top” of it. These are fairly average sinkage results compatible with most other mattresses on the market. As we’ve discussed throughout this review, while you’re likely to sink in a bit into the hyperelastic polymer layer up top, the bounce from this section combined with the lift of the pocketed coil system is going to leave you feeling like you’re sleeping on top of the bed. Keep in mind that these results are for the P3, the line’s medium firm option. As you can see in the graphic above, the P4 exhibited slightly more sinkage and the P2 showed just a little less. 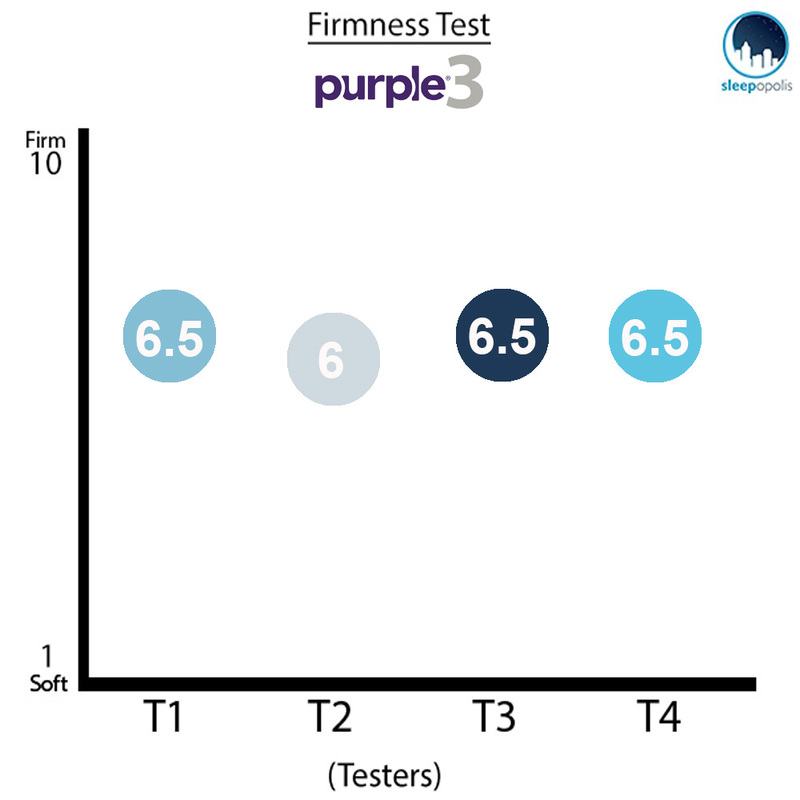 These results are consistent with how these mattresses have performed on my other tests, demonstrating that the three beds really do represent a clear gradient from firm (Purple 2) to soft (Purple 4). Last but not least, I’m going to chat with you a bit about edge support. This section will be important for those of you with bed mates who need to know if you’ll be able to use the entire surface area of the mattress. Lying near the edge of the bed in this position, I felt as supported as I did in the center. As you get closer to the side, you will notice a slightly different feel from the top layer as the comfort grid is replaced by the high-density poly foam edge support. As you can see in the photo above, once I rolled onto my side I did note a bit of compression through the top layer, but nothing that made me feel insecure at the edge. The foam support here did a fantastic job of buoying me on top of the structure, making me feel comfortable and solid. In this position, I wanted to simulate what it would feel like to be sitting on the bed in the morning when you’re lacing up your shoes and getting ready for the day. A lot of mattresses experience severe compression in this position, but the New Purple actually held up very well. In my opinion, the edge support on this bed is super strong. Shipping: Free, but unlike the original Purple it doesn’t arrive compressed in a box. The company does provide complimentary white glove delivery, in-home setup and will take away your old mattress for you! If you’re convinced the New Purple is the right mattress for you, the size and pricing information for the mattress are below. Please note that these prices reflect standard pricing, but Purple will occasionally offer special deals or discounts. I’ve included separate tables for the P2, P3 and P4 mattresses. 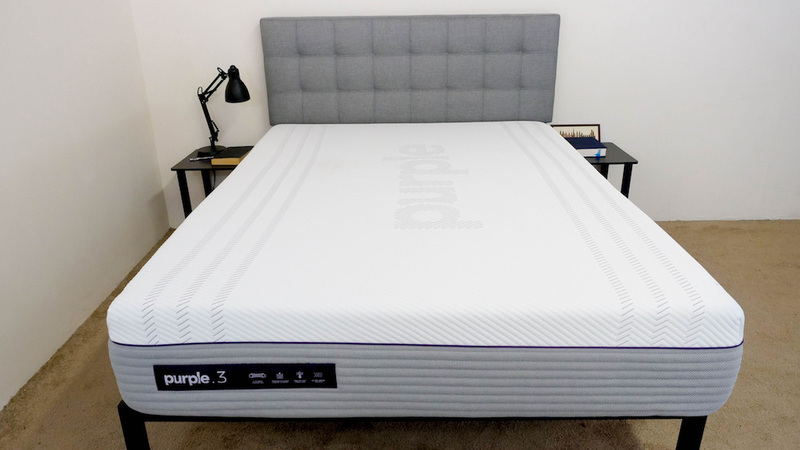 After taking a deep dive into the New Purple, let’s round out this review by talking about some of the key differences between the brand’s two mattress. Design – The biggest thing you’ll notice is the difference in design. 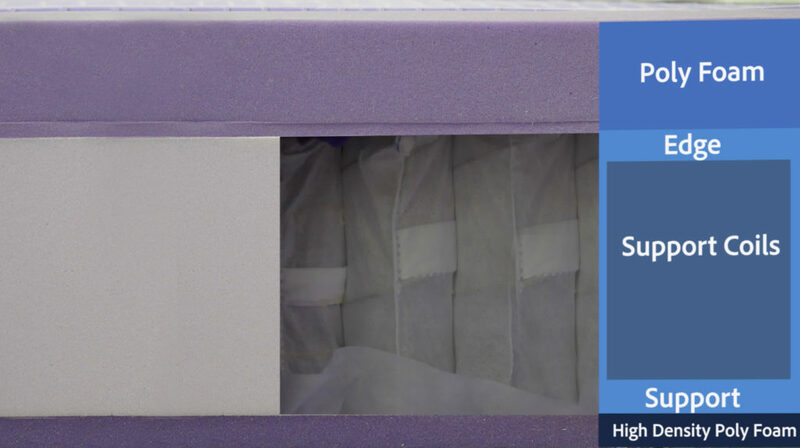 The New Purple features a pocketed coil system, which helps to make it a slightly more supportive bed than the Original Purple. These individually wrapped coils also help to isolate motion throughout the structure super well. Bounce – In my opinion, the New Purple is much bouncier than the Original. This mainly has to do with how the pocketed coil system interacts with the hyperelastic polymer in the comfort layer, creating a lift that keeps you placed on top of the bed. Edge support – The inclusion of edge support also helps to amp up the overall stability of the mattress, giving it a slight edge (pun deeply intended) over the Original. IS THE NEW PURPLE MATTRESS RIGHT FOR YOU? Now that we’ve taken a closer look at the New Purple mattress, it’s time to discuss who it’d be a good fit for. 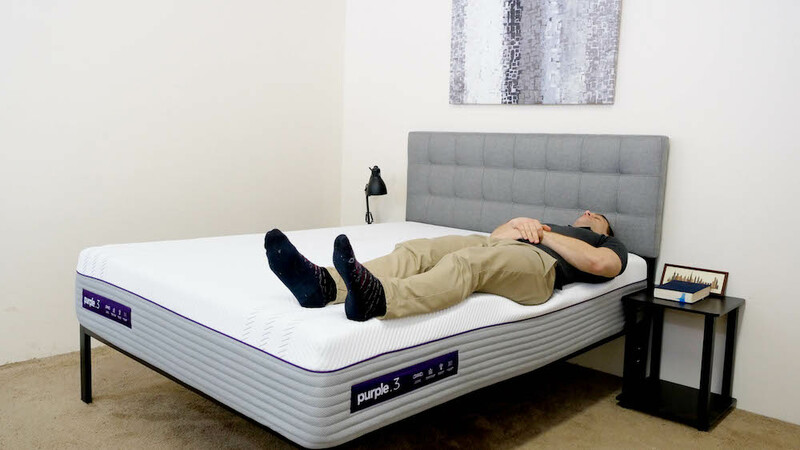 Need pressure relief – The New Purple features an excellent combo of pressure relief and support, so could be a great mattress for anybody who needs to alleviate chronic pain. Want to sleep cool – Designed with an open structure, the comfort grid encourages a lot of quality air flow throughout the structure, which keeps things from getting too hot. Like bounce – If you like a bouncy mattress, you’re going to find a lot to love in the New Purple, as both its comfort and support layers feature plenty of buoyant lift. Need Support – Speaking of support, the New Purple offers an incredible supportive lift, which will help sleepers move around in bed and change positions. Durability – The pocketed coil system and hyperelastic polymer also work together to make this a highly durable mattress. So while you’ll spend a pretty penny up front, it’s sure to last for a long time. 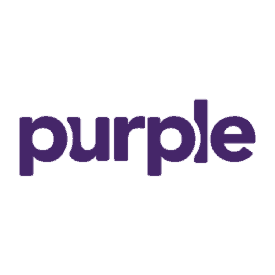 For more information on the New Purple, check it out here! Best known for their proprietary hyperelastic polymer, Purple now features three new versions in a line that features varying heights of polymer over pocketed coils, creating very bouncy mattresses. The changes in height of the comfort layer grid give the new variations of the Purple different benefits depending on what position you sleep in. I found all three to sleep very cool — Purple markets their mattresses as “Temperature Neutral” — while providing a mix of support and pressure relief.